PHOTO: Separated at birth? 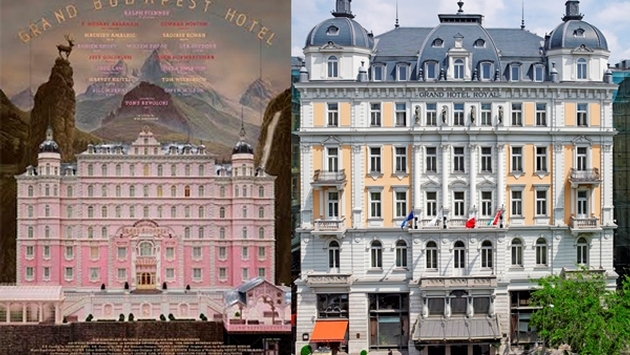 The theatrical poster for Wes Anderson's Grand Budapest Hotel and the Corinthia Hotel Budapest side-by-side. Could the Corinthia Hotel Budapest be a model for Wes Anderson’s Grand Budapest Hotel? The world of cinema has found a comfortable home in the venerable hotel. The Corinthia Hotel Budapest played an interesting role in the origins of European cinema back in 1896 when the Lumiere brothers, who invented motion pictures, held their first film screening outside of Paris in the hotel. In 1915, the Hotel’s Royal Ballroom was transformed into the Royal Apollo Cinema seating over 1,000 viewers. In 2002, Corinthia Hotels painstakingly restored the original Grand Hotel Royal to its former glory. The new film, the Grand Budapest Hotel by director Wes Anderson, tells the story of Gustave H, a concierge at a famous European hotel between the wars. The Corinthia Hotel Budapest, which originally opened in 1896 as the Grand Hotel Royal, shares several similarities with the movie’s fictional Grand Budapest Hotel, including a remarkably similar facade. The Corinthia Hotel Budapest is now reaching out to lovers of cinema with the three-night “Behind the Scenes” stay. The package begins with a “Behind the Scenes” tour at the hotel, learning about the history of the Hungarian film industry which has its roots in the Corinthia Hotel’s Grand Ballroom. Guests will also have access to the historic Royal Spa, which is 10 years older than even the original hotel. The package also includes the opportunity to attend a VIP Grand Budapest Hotel movie screening at the Arena Plaza cinema (guaranteed from March 20 to April 9) and a walking tour of the Hungarian capital’s most famous movie set locations. The package also features a cruise on the Danube. Priced from €842 ($1,150) for two, including buffet breakfast, the package is valid from March 20 to Dec. 25. 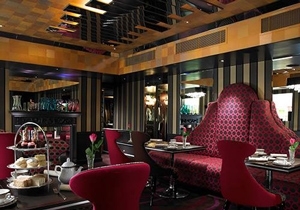 Flemings Mayfair launched a £2 million refurbishment program. The luxury boutique hotel was originally converted from six Georgian townhouses. Six newly refurbished suites and apartments will be unveiled in April, including the penthouse and roof terrace. Hidden away on Half Moon Street, the new suites and apartments will offer luxury accommodation in Mayfair with the highest level of service and a separate entrance on Clarges Street ensuring absolute discretion and privacy. Each of the one-, two- and three-bedroom suites and apartments will have its own individual theme. The discerning use of space and contemporary design features seeks to provide guests with naturally lit living areas and fully equipped kitchens. The second phase of the refurbishment will address the hotel’s 115 rooms. It will begin in early 2015 following an additional £1 million injection.